This is the second book in the series and I would recommend that you read the first one, as there are several characters that make an appearance. In this story, you have someone who is somewhat broken and living with guilt. Dayne is living with survivor's guilt and despite his bright future, he doesn't really know what to do with it. He is working his way through a degree and in doing so, is able to take some specialized courses. While he was taking those courses, he was required to write a paper, which led him to the Indian School. Lawson is a fellow firefighter of Morgan. He is a hard worker but a huge risk taker. He also enjoys extreme sports – skydiving, base jumping, etc. When he sees a cutie in the library one day, he definitely wants to know more; however, he doesn't really know how to get a new meeting. When he runs into the cutie from the library, it isn't an ideal situation. However, Lawson offers his home to Dayne. What ensues is a love tale that is centuries old, entwined with Lawson and Dayne's love story. I really enjoyed how their story had a kind of mirror image to Lawson's grandfather's story. Both stories were sweet and kind, had a developed relationship, and even though they weren't tearing up the sheets the way some Grey books do, it was still a great combination. 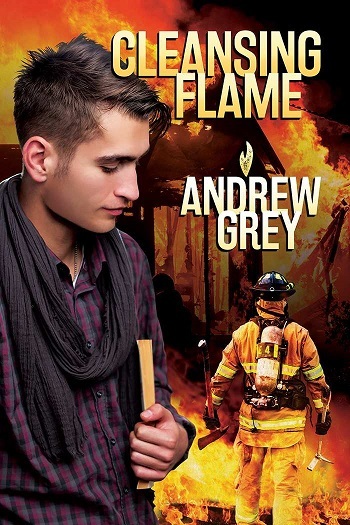 Reviewers on the Wicked Reads Review Team were provided a free copy of Cleansing Flame (Rekindled Flame #2) by Andrew Grey to read and review. Yes to firefighters! I have a soft spot for people in uniform! Firfighters I have to agree are totally HOT! They're okay. But as an asexual I also don't get sexual attraction especially based on body only. Aesthetically they're maybe pleasing to look at.